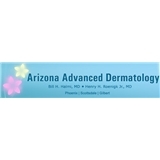 Arizona Advanced Dermatology (Scottsdale) - Book Appointment Online! Arizona Advanced Dermatology has cared for over 100,000 patients in the past 15 years. Using the most "up to date" procedures and technology available, we have dedicated ourselves to providing excellent care to our patients. Whether you have a dermatologic condition relatively common to Arizona residents such as skin cancer, eczema, acne, psoriasis, or have a cosmetic concern, Arizona Advanced Dermatology offers numerous treatment options for you. Arizona Advanced Dermatology excels in cosmetic laser technology, ensuring safe, effective and virtually pain-free procedures with beautiful outcomes. Our laser technologies include: Fraxel, VBeam, Perfecta, Erbium, GentleLase, Ruby, CO2, Excimer, and VariLite. If you are seeking a more toned, youthful and softer appearance, then consider one of the many affordable, cosmetic treatment options offered by Arizona Advanced Dermatology. I was a little nervous but she was awesome. She made me feel very welcome and was great. I really liked her. I went in for a checkup and had very little wait time and everything went well. Dr Halmi has been taking good care of me for around 8 years. He answers questions in an easily understood manner and makes you feel comfortable.